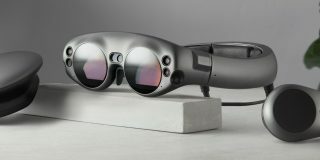 We’ve been hearing whispers for years, and now Google-backed Magic Leap has taken the wraps off their augmented reality headset’s Creator Edition. 9to5google.com says they will be shipping in 2018, too! The setup consists of a ‘Lightwear’ headset connected to a circular ‘Lightpack’ via a couple cords…the Lightpack contains the processing and graphics, in a mid-sized disk that hangs off a belt or pocket…and a Control’ remote (smaller than most TV remotes) that provides for 6 degrees of freedom and movement. The headset has tech that detects and stores the exact location of walls, surfaces, and physical objects, and also what they are calling ‘360 degree sound field audio.’ The interface accepts inputs from voice, gestures, head poses, and eye tracking. No word on pricing for the Creator Edition yet, but their SDK should be released along with it, in addition to other tools for web and game developers. Apple is readying to let developers release universal apps that will work across iPhones, iPads, and Macs early next year. In a Bloomberg News writeup picked up by macrumors.com, the official announcement and details could come in June at WWDC 2018. So far, it’s not known if Apple will merge the Mac App Store with the vastly more popular App Store for iOS, but that seems logical. The move would mean better apps for the Mac, since developers put a lot more time and energy into making apps for the more widely used iPhones and iPads. In the wake of the FCC killing net neutrality here in the US, Britain has taken the opposite position. According to rawstory.com, the UK has deemed high speed internet a legal right for all citizens, and will require that never household is wired for it by 2020.. Communications company BT has pledged to drop around $788 million to connect about a million and a half rural homes to the net. Right now, about 95% of homes in the UK have broadband connections with 24 Mbps or higher speed.